Skil is always thinking of ways to make your work easier – and that is why the Skilsaw 5680-01 model with single beam laser is a half-pound lighter than its older siblings, making it easier to handle and control. But don’t let the smaller size fool you. This machine comes with a powerful 14-amp, 2.5 horsepower motor – enough power to help the blade cut smoothly through almost any type of wood. Skil also gives you your money’s worth by giving this model a ball-bearing motor construction for longer life. While the 5680-01 has a more compact body, its foot is slightly wider than the ones on previous models. This makes the saw more stable and easier to work with at different angles. To date, there are only 17 customer reviews for this product on Amazon, but no one gave ratings below 3 stars, resulting in a cool average rating of 4.5 out of 5 stars. Users love that it is lighter. In spite of its relatively affordable price, customers think it performs just as well as more expensive brands. 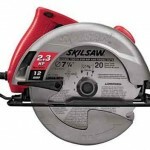 One reviewer thinks the secret is in the Skilsaw’s rigid base plate. Since it stays in place and doesn’t bend from the weight of your hand, cuts are more accurate. There is also lower vibration which helps you make smoother cuts, helping you finish jobs at a faster rate. 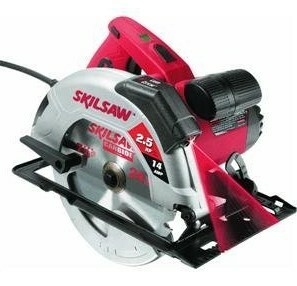 On top of that, customers also love the Skilsaw because it doesn’t make too much noise. You will also notice that it doesn’t throw around too much saw dust, leaving you with less mess to clean up after. Of course, as great as this saw kit may seem, it does have a few flaws. Customers who only gave 4 stars complain that one could not see the laser beam when working under direct sunlight. Another reviewer also wished there was a spindle lock so that changing the blades can be easier. Only 2 customers didn’t seem too happy with their purchase. One of them thinks that the 5680-01 is poorly designed and that the positive reviews overhype this product. 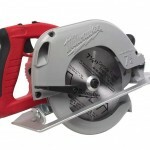 Based on the numbers, customers are generally pleased with the Skilsaw 5680-01. For its price, its performance exceeds their expectations. The powerful motor provides smooth and precise cuts, its lighter size and wider foot make it easier to control, and as one reviewer pointed out, the Silksaw 5680-01 has a sturdy and rigid base plate. This provides better stability when cutting. Needless to say, we think the Silksaw 5680-01 is a great buy. It’s perfect for weekend jobs around the house and even for construction work.